Good morning beautiful people of the Internet! Hope you had a fabulous week! I had a pretty good one! Right now as you're reading this I'm at Go Blog Social's workshop here in KC. It's my first ever one so I'm a bit nervous but mostly excited! A full recap of my day will be coming very soon. 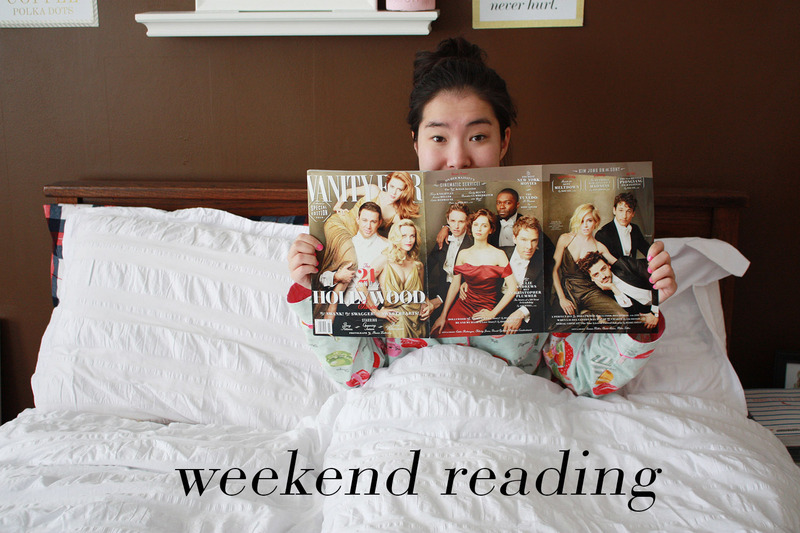 So while I'm learning about blogging and social media and networking, you can read what I've favorited this week! Jimmy Fallon and Justin Timberlake opened up #SNL40 with a musical number. It was one of my favorite parts as they are my favorite duo ever! They have such a great chemistry and friendship! Jimmy recaps the crazy, "I can't believe this is happening" After Party and sings with Prince, Paul McCartney and more! Today is the Oscar's! Who's excited?! I am! If you're throwing an Oscar's party or camping out on the couch like me, don't forget to print out your ballot to keep up with the winners! .... and to keep track of the best dressed of the night print out this card! In true Oscar's fashion (pun intended), check out Sugarscape's article on the best Red Carpet Oscar's outfits ever! Brangelina and Beyonce slaaaay! One of my friends Sarah started her own blog! She blogs about fashion, beauty, health + fitness, photography and Anything and Everything in between. Check her blog out and follow her! Check out The Everygirl's list of Do's and Don'ts for wearing ankle booties. Wonder how your favorite Instagrammers get their perfect photos? Well one of my favorite's is sharing her tips for taking amazing Instagrams! I am so in love with Julia of Lemon Stripes master bedroom tour. I love the way she styled it and how the colors of white, gray, navy and a pop of pink work so well together! Also from Lemon Stripes I'm pretty obsessed with this outfit. I love how cool, casual and sporty it is. I may just have to recreate it myself! But when the weather warms up! Loving this article from NY Racked about Carly, Jessica, Mckenzie and their 'preppy' New York style! It's a bit lengthy but well worth the read! Thinking about starting a new blog but haven't a clue about where to begin? Check out Kathleen of Carrie Bradshaw Lied's tips for new bloggers! Always wondered what it's like to style the beautiful and famous for events and shoots? Read this article from Levo League to find out! I'm currently loving: trench coats, midi flare skirts, Daniel Sharman from Teen Wolf and this luggage set. That's it for this week's Weekend Reading! Have a wonderful Sunday and see you tomorrow! What have you been loving/reading from the world wide web this week? Leave me a comment or a link to let me know!